Please note, version 3 pages are still available for your reference, but we have disabled links to avoid confusion: please refer to the Data Futures Resources page for project documents for your consideration. The concept of segments as shown below was presented below as a way of understanding the new collection schedule, but this concept has not been carried forward to the detailed design phase or implementation and transition. The diagram below shows high-level view of how the demand-side segments are collected. In this case, the diagram is aligned to a 3-year full-time programme of study. Note funding and monitoring is not shown on this diagram. 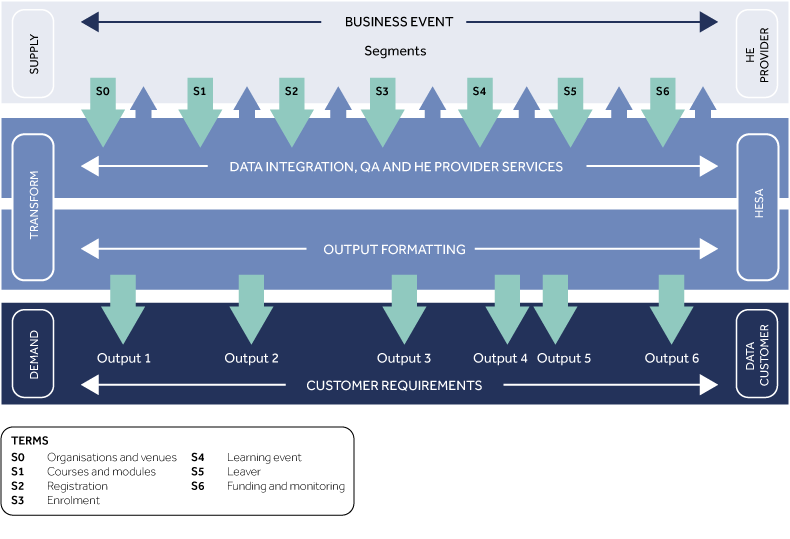 It is built out from the V2 original concept separating the demand and supply side and using the segment approach to submitting data. There is no concept of an academic year. Providers will have different – for example – registration dates within the calendar. These will submitted to the natural event timeline fixed to the period between when the event occurs and when the data is required for a reference point.